This is no Caddy Shack display! Dark Bronze Anodized 80 ft. flagpole with an eagle ornament on top. This flagpole displays a massive 20x30 ft. American flag and a 3x5 ft. custom Wheeling Park District flag. Both of which appear to be new. This just goes to show, you never know what you are going to find in the backyards of communities along the Des Plains River Trail. That is what has drawn us to run this 133 mile trail. An impeccably maintained forest trail from Wisconsin to Chicago, winding through town to town. A trail can not only link towns, but give access to the beauty these towns have to offer. For us, it is here at the Chevy Chase Country Club. A new flag always looks beautiful, but doesn't always reveal the story of its flagpole parts. It is hard to know if the parts are doing their job or if the flags are lasting over time. But what you can see right away, are missing parts. Out of the box, a flagpole will not come with everything you may need to fly the flags correctly. Most deluxe internal winch system flagpoles will come with a few retainer rings, but you may need more. You might find one flag arrangement to fly a large flag, but that will not allow you to fly two flags. Worst off, the instructions might not be sufficient to show you the best way to hang the flag. In this case, there is not enough retainer rings. The retainer ring at the bottom should also be attached at the top of the weight. A retainer ring helps draw the flag into the flagpole, keep the system tight, yet with enough give as to no create stress points. As you can see in this photo, the flag bells out away from the arrangement and flagpole at the middle of the header. This is a good sign you need a few additional retainer rings. Best to keep the system in good shape. Over time, retainer ring beads will crack and fall off. That is a good sign to replace them. 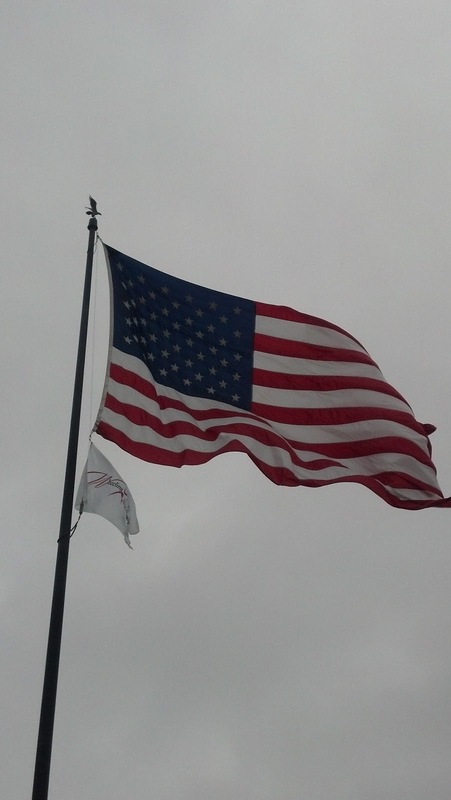 We solute the Chevy Chase Country Club for keeping the flag new and flying an impressive display!